Summer is right around the corner, I can feel it! I even got a little sunburn on my back while working in the garden this weekend. Of course it got rainy and cloudy again the very next day, but I am sure that summer will push it’s way back again. And with summer comes barbecue season. Yeah! Nothing is better than warm nights eating outside with friends. I’m always looking for new salads to take to summer barbecues. I am a huge fan of the traditional potato or macaroni salad, but we are trying to eat healthier and summer barbecues are definitely full of all kids of less than healthy goodies. I can’t stop myself when there are potato chips around (which is why I never buy them), but maybe if I have something else to eat I will eat less… maybe! This is my new favorite salad for that. 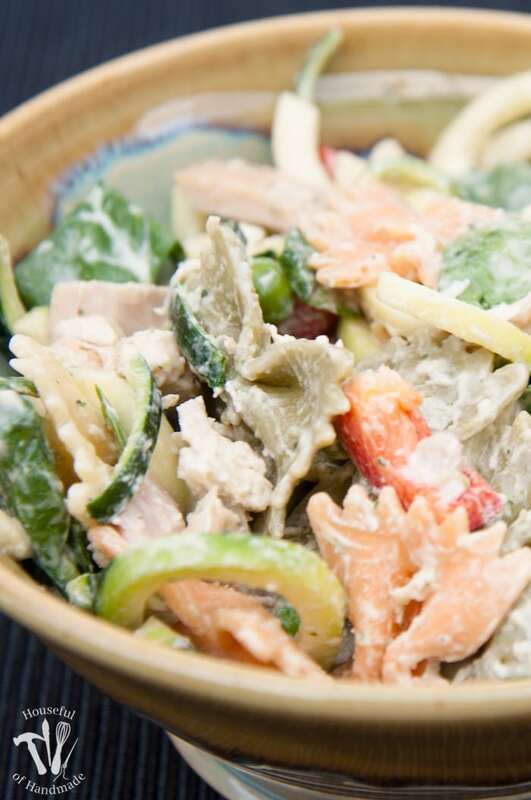 This healthy creamy Italian pasta salad is packed full of vegetables then I made the creamy Italian dressing with my favorite healthy substitute: Greek yogurt. Now I have a flavorful salad that I can feel good about eating alongside a half a bag of potato chips. To make this pasta salad filling and healthy I decided to fill it up with as many vegetables as I could. I started with a zucchini that I cut into half moons with my Paderno vegetable spiralizer. If you love vegetables (or want to love them more) you will love this spiralizer. 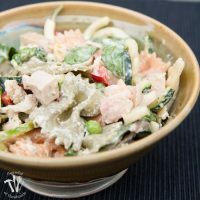 I use it to make all kinds of vegetable goodness that my family loves to eat. Yeah! Then I tossed in a red pepper, some peas and some baby spinach. 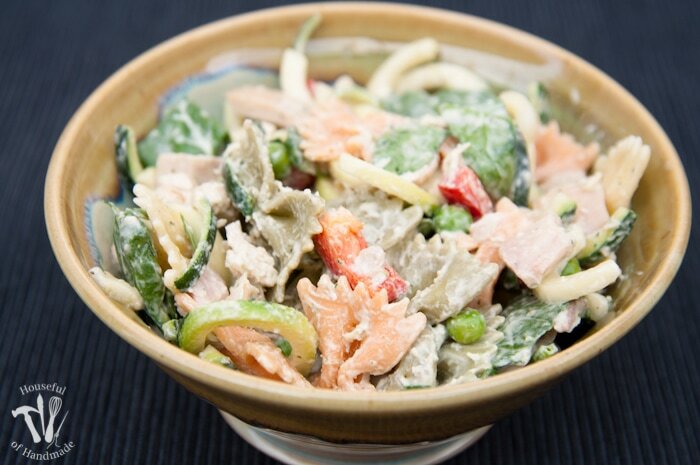 Now my large bowl of pasta salad was over 50% vegetables, the perfect start to a healthy pasta salad! Next came the perfect dressing. I love creamy dressings, and I really don’t mind using mayonnaise in them when I out them on a green salad because I only use about a tablespoon of the final dressing. But when I make a salad like this and want to have everything well coated in the creamy goodness, I don’t want a dressing full of mayonnaise. I’ve have been using this delicious recipe for Homemade Creamy Italian Dressing from Two Bite Club and love it, but I decided to try it with Greek yogurt instead of mayo and sour cream and see if it would be as good. And it was! I also beefed up the amount of herbs for a bit more punch and then made making the dressing easier by just throwing everything into a blender and hitting the button. 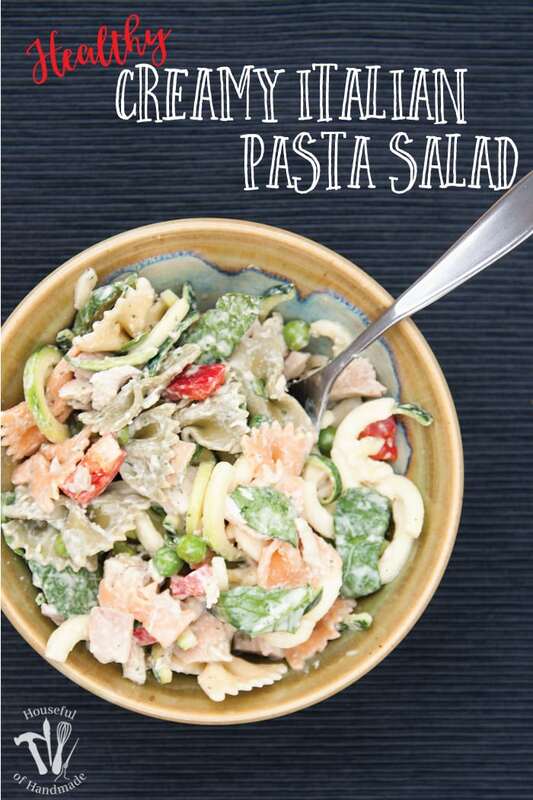 Create the perfect flavorful salad for summer, but keep it healthy with this Healthy Creamy Italian Pasta Salad. Full of the creamy goodness you want without mayonnaise or sour cream. Cook pasta according to directions on package. When cooked to desired doneness, strain and run cold water over pasta to cool it. Add to large bowl. Spiralize zucchini into half moons with a spiralizer or roughly chopped. Add to bowl with pasta. Roughly chop red pepper and baby spinach. Add to bowl with pasta. Add peas and chopped chicken to pasta and stir to combine. For dressing, add all ingredients to a blender and blend until smooth. Pour half the dressing over the salad and stir. Add more dressing as desired. So bring on summer and barbecues and pot-lucks, because I am ready! Oooh, does this sound good! Perfect addition to a summer picnic or cookout. Pinned and tweeted. Thanks for sharing at Merry Monday, hope to see you again next week! Thanks so much for sharing Chelc! 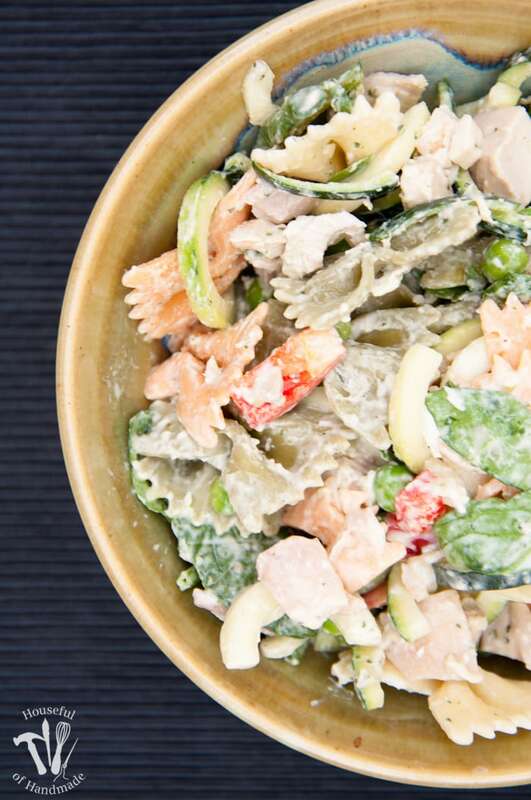 Oh how I love an awesome pasta salad and can’t wait to try this salad for our first summer cookout party! Thank you so much for the inspiration! Thanks Ashley! It’s perfect for summer cookouts. This looks wonderful – and I love how many veggies you packed in here! I’m not a fan of mayo, so I’m more than happy to use Greek yogurt in its place. One question – did you use regular or non-fat Greek yogurt? Great question! I used non-fat Greek yogurt that I made myself (the link is in my recipe). But the regular stuff would work great too, just add a bit more creaminess. I’ll update the recipe.